Welcome back to our little cabin! Today I'm sharing our bedroom! Our one cabin bedroom is truly small, but we're fitting a lot into it to make our weekend visits as comfy and cozy as home sweet home. 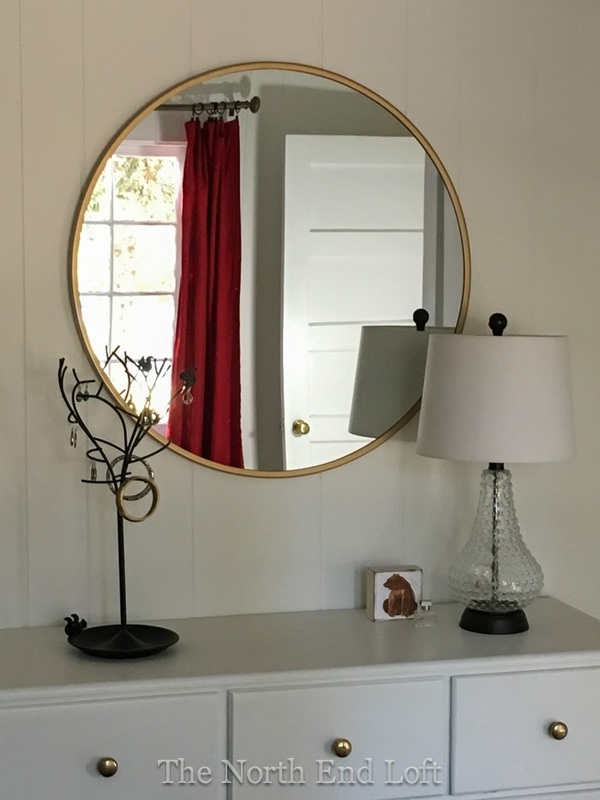 The latest additions to our bedroom are a dresser, a round brass mirror, a darling glass table lamp, and a cute metal jewelry stand. Except for the dresser, I just realized everything is from Target. 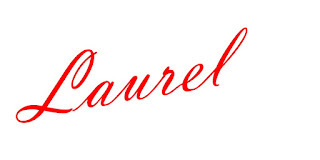 I'm not affiliated with Target; I just happen to find some great inexpensive things there and want to pass the information on in case you might like them, too. This nine drawer pine dresser was in my parent's Saratoga, California home for as long as I can remember. My mother had painted it a beautiful deep blue with a dark antique glaze for her very elegant master bedroom. She loved unique finishes in her home and became a furniture painting DIY-er way before it was popular. 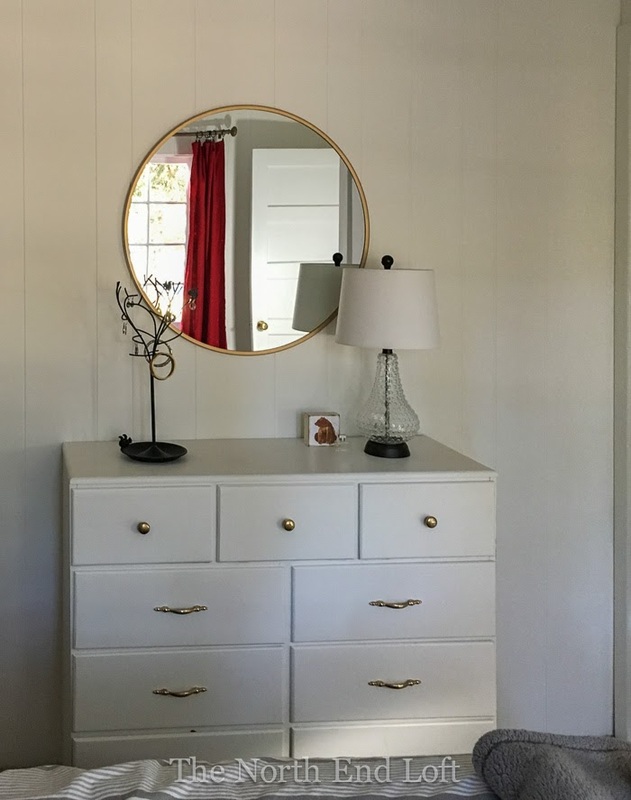 When I inherited her dresser as a more casual young woman, I painted it white and changed the knobs to shiny brass for our guest bedroom. Later, it moved out of our house with my youngest daughter. When Annie got married and bought her own home and a mid-century modern dresser to match it, I took this one back. I gave it a fresh coat of white paint, toned down the knobs with a bit of antique gold rub 'n buff, and brought it up to the cabin. Because this sweet dresser is very narrow, it fit the space between our bed and the wall perfectly. No other dresser would have done. My mother would have been so tickled by her dresser's long journey to its latest home in our little mountain cabin! I found that if my jewelry stayed in its travel case when we came to the cabin, I forgot to wear it. When I saw this jewelry stand on a shopping trip to Target, the little squirrels reminded me of our cabin chipmunks. 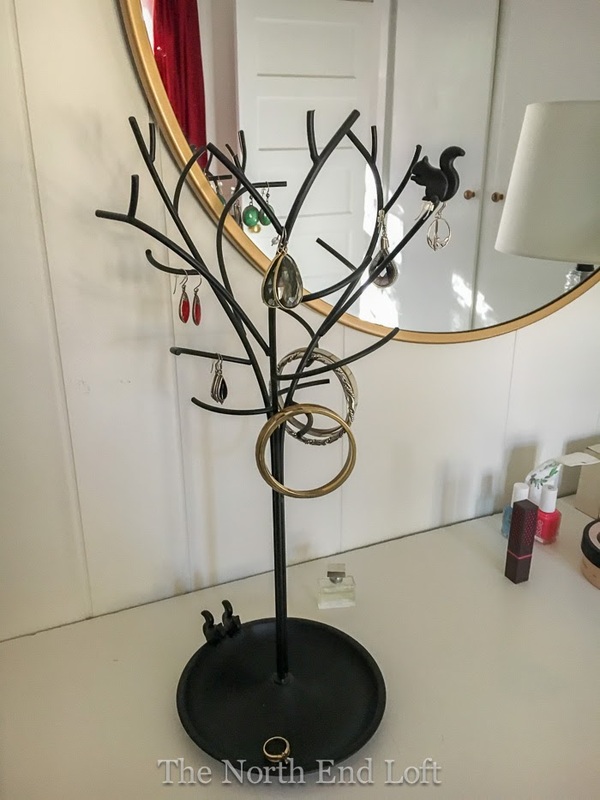 It's the Loft by Umbra Squirrela Jewelry tree. Now, I hang my jewelry here when I unpack and remember to put it on when I get dressed. I love how the earrings look like flowers hanging on the branches - so cute! 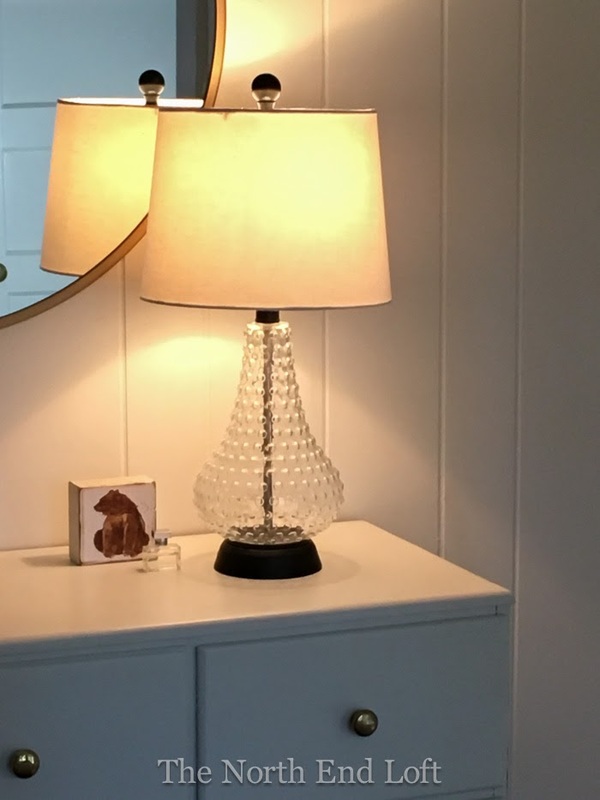 I fell in love with this clear glass hobnail lamp when I came across it in a photo online and then hunted it down to, where else but... Target! 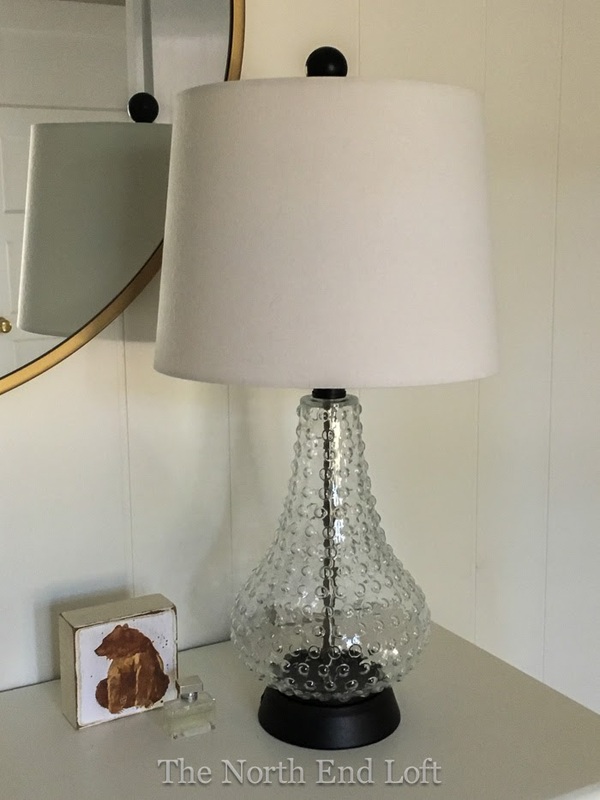 This is the Canary Jane Table Lamp Clear from the Beekman 1802 Farmhouse collection. I bought it for our Boise house, then I couldn't find the right spot for it - so up to the cabin it came. 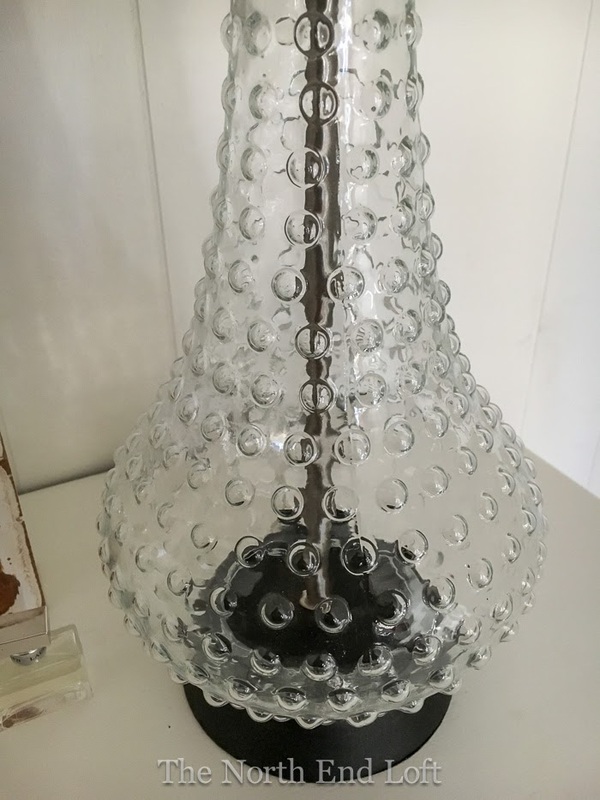 The knobby glass reminds me of a vintage chenille bedspread. I think it gives off the prettiest light. I turn it on every evening at dusk to softly light our bedroom. Its glow makes our cabin look so cozy through the window from outside on snowy winter days, too. 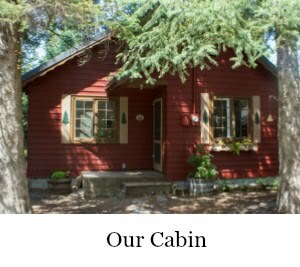 Our cabin is so tiny, we like everything we bring into it to not only be special to us, but to also have a purpose. 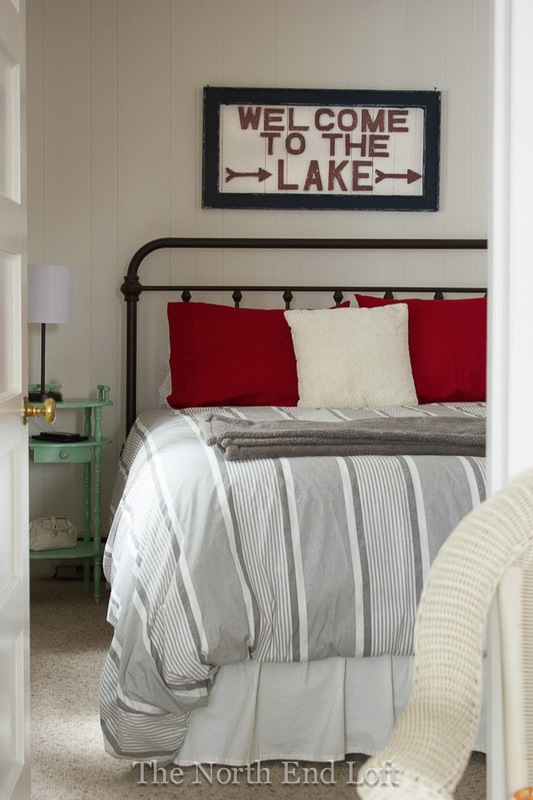 Little by little we're finding inexpensive things we love to keep it cozy and make it our own. Thanks so much for stopping by today! I hope you're having a wonderful weekend! I just love to party! 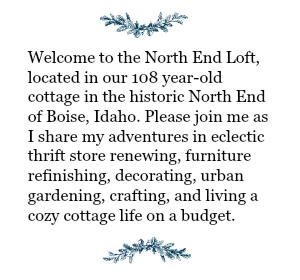 A note from The North End Loft about your comments: I deleted fifty comments from my most recent blog posts by mistake while cleaning up some spam comments one day. You should have seen my face when I realized there's no way to retrieve them! I had read every comment as it was received way before making my mistake, though. I just wanted you to know why your comment's not here anymore. Hopefully, I won't make that mistake again, and I hope you'll continue commenting if the mood strikes you. Thank you! 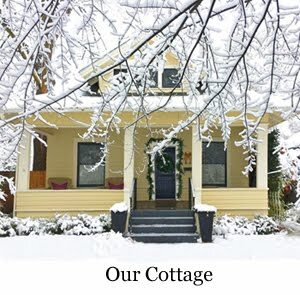 Boise Boys - The Best HGTV Flip Show Yet!